^ Sumption, J. (2009-03-19). The Hundred Years War 3: Divided Houses. London: Faber & Faber. p. 274. ISBN 978-0-571-13897-5. 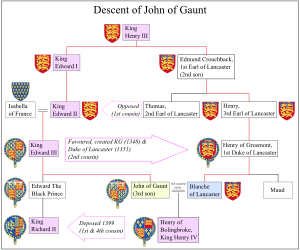 ^ "John of Gaunt, duke of Lancaster". Encyclopædia Britannica. 1999-03-21. ^ Sherborne, James (1994-07-01). Anthony Tuck, ed. 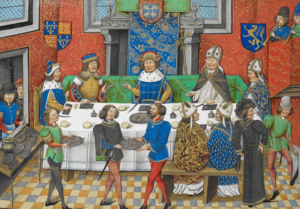 War, Politics and Culture in 14th Century England. London: Hambledon Press. p. 32. ISBN 978-1-85285-086-9. The former title for "Clerk of the King's Ships" had been "Keeper and Governor of the King's Ships and Warden of the Sea and Maritime Parts". 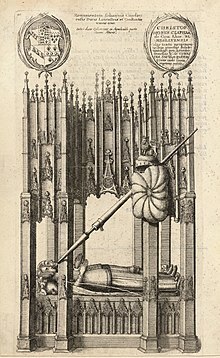 Crull had served Edward III in this capacity from 6 October 1359 to 22 September 1378. Rodger, N. (1997). The Safeguard of the Sea: A Naval History of Britain, 660–1649. London: HarperCollins. p. 99. ISBN 978-0-00-255128-1. ^ Chaucer, Geoffrey (1984). "The Legend of Good Women". In Benson, L. D.; Robinson, F. N. The Riverside Chaucer. Boston: Houghton Mifflin Company. p. 600. ISBN 0-395-29031-7. ^ Wilcockson, Colin (1987). 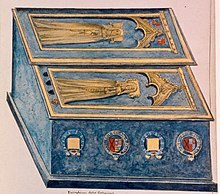 "Explanatory Notes on 'The Book of the Duchess'". In Benson, L. D.; Robinson, F. N. The Riverside Chaucer. Boston: Houghton Mifflin. pp. 966–976. ISBN 0-395-29031-7. ^ Gross, Zaila (1987). "Introduction to the Short Poems". In Benson, L. D.; Robinson, F. N. The Riverside Chaucer. Boston: Houghton Mifflin Company. p. 635. ISBN 0-395-29031-7. Nicolle, D. (2011-05-20). The Great Chevauchée: John of Gaunt's Raid on France 1373. Raid. 20. Oxford: Osprey. ISBN 978-1-84908-247-1. Gairdner, J. (1911). "Lancaster, House of" . In Hugh Chisholm. Encyclopædia Britannica 11th ed. 16. Cambridge University Press. Kingsford, C. (1911). 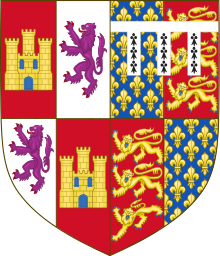 "Lancaster, John of Gaunt, duke of (1340–1399)" . In Hugh Chisholm. Encyclopædia Britannica 11th ed. 16. Cambridge University Press. Thompson, E. (1892). 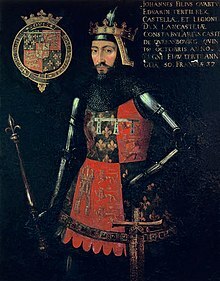 "John of Gaunt" . In Lee, Sidney. Dictionary of National Biography. 29. London: Smith, Elder & Co.